Want to lose weight but aren’t fond of any of the diets out there? Did you know that you can actually lose weight by drinking? We’ve rounded up the best fat burning drinks so you can cut down on those unwanted pounds while still enjoying life! 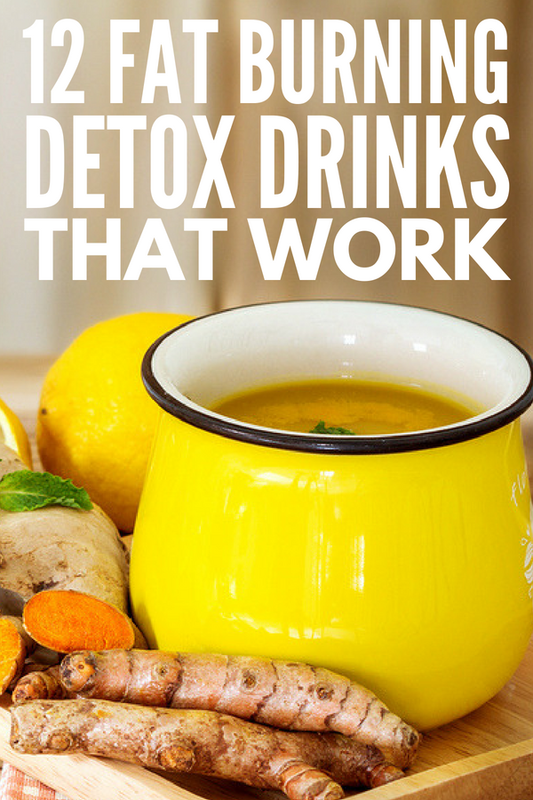 Whether you want to go all-natural with DIY weight loss drinks, or prefer branded slimming drinks that have rave reviews, we’ve rounded up 12 weight loss drinks that actually work. What Are the Benefits of Weight Loss Drinks? Quality weight loss drinks are packed with vitamins and nutrients that do your body good. With good-for-you ingredients, weight loss drinks flush your body of toxins, boost your metabolism and help you lose weight in a healthy way. Instead of putting yourself through a strict diet and depriving yourself of foods you love, weight loss drinks help you slim down by ridding your body of excess waste. Weight loss drinks also help to suppress your appetite and make you feel full for longer so you don’t snack on high sugar, high calorie foods throughout the day. This keeps you from gaining excess weight and feeling slow and sluggish. Are Weight Loss Drinks Safe? Yes, weight loss drinks are safe, and in fact, they’re a healthy way to help you shed your unwanted pounds. They’ll help you jump-start your weight loss journey, and are packed with vitamins, nutrients and proteins that are beneficial for your body. They work best as part of a healthy eating plan, and you’ll see the best results if you pair weight loss drinks with a healthy diet and exercise. How Many Weight Loss Drinks Should I Drink Per Day? When it comes to how many weight loss drinks you can consume per day, you have to look at a number of factors, including lifestyle, weight, physical activity levels, and the type of weight loss drink you’re drinking. Natural weight loss drinks like detox waters can be consumed much more than weight loss shakes. If you buy weight loss teas and shakes, it will tell you how many to drink per day on the package. For most meal replacement weight loss shakes, you can have 2 per day. The same goes for weight loss teas. If you have a sedentary lifestyle and are drinking detox water, you can have between 6 to 8 glasses a day, and if you’re an active individual you can have from 8-12 glasses per day. Apple cider vinegar is known for its weight busting, metabolism boosting benefits. It helps reduce your body fat percentage and decreases your belly fat by lowering your blood triglycerides. Its pectin fiber also helps suppress your appetite, making you feel fuller for longer! This ACV drink is just what you need to drop your unwanted pounds. 2. Lemon Ginger Detox Drink | Skinny Ms. Lemon and ginger work wonders together when it comes to burning fat and cleansing your body. Lemon is a great digestive aid, and ginger is a powerful detox ingredient that revs up your metabolism. When your metabolism is boosted throughout the day, you can flush fat while you eat and burn extra calories when you workout. Drink this fat burning concoction before bed and wake up loving the results! With a combination of fat burning ingredients, including lemon, ginger, parsley and cucumber, it will boost your metabolism, strengthen your immune system, and eliminate any body fat you can do without. This weight loss tea cleanses waste, purifies the body, and increases the metabolism. A blend of detoxifying ingredients including cinnamon, rose hips, papaya and senna, this slim tea reduces bloating and inflammation. It promotes weight loss and digestion by promoting an environment where healthy bacteria can grow and flourish. This delicious combination fights inflammation and toxins, helping you get a flat tummy. We’ve gone over the benefits of lemon and ginger, but turmeric is one of the world’s most powerful anti-inflammatories and helps your body get back to health, especially if you previously had a poor diet. Mix these three ingredients together in water, and you have one of the best weight loss teas. This 14 day and night teatox blend is made with garcinia cambogia and dandelion root for ultimate weight loss. It helps increase your metabolism and put unhealthy cravings to a halt. It also helps eliminate toxins to detoxify and cleanse the body. Have you ever heard that eating half a grapefruit before breakfast can help you eat less and lose weight? Grapefruit and pineapple are both known to have metabolism boosting and weight loss properties, so the blend makes them a match made in weight loss heaven! Jillian Michael’s knows her stuff when it comes to fitness and weight loss, and this fat burning drink is no different. With cranberry juice, lemon juice, and organic dandelion root tea, there’s so much goodness in this detox water. Dandelion tea improves digestion and aids in weight loss so it’s the star in this blend. This green smoothie will kickstart your metabolism into high gear and curve your appetite, helping you lose the weight you want. Made with ingredients like baby spinach, banana, pineapple, ginger and chia seeds, it will also help you burn calories when you’re not doing anything at all. Only 100 calories per shake, this low carb meal replacement is filled with 15 grams of protein and 24 essential vitamins and minerals to keep you satisfied and energized. Without unnecessary calories, carbs and sugars, you can fill up on this shake and lose weight all at once. This meal replacement shake helps you curb hunger for up to four hours, and is recommended to replace 2 of your meals per day. With 10 grams of fat, 5 grams of fiber and 24 essential vitamins and minerals, this shake helps your body process and burn stored fat, making it easier for you to lose weight! With a versatile sweet corn flavor, this low carb meal replacement shake is packed with over 20 nutrients, protein and fiber, to help your body blast unwanted fat. It will keep you full and satisfied so you don’t mindlessly snack, plus it tastes delicious! These simple and delicious weight loss drinks will keep you satisfied and help you drop excess weight. Whip them up and enjoy! If you loved these belly fat banishing weight loss drinks, please share this post on Pinterest! And if you want more weight loss recipes, please follow our Health Board on Pinterest!